THE PULSE: Sabre reports strong increases in revenues and ABITDA for Airline and Hospitality Solutions in the first quarter of 2014. 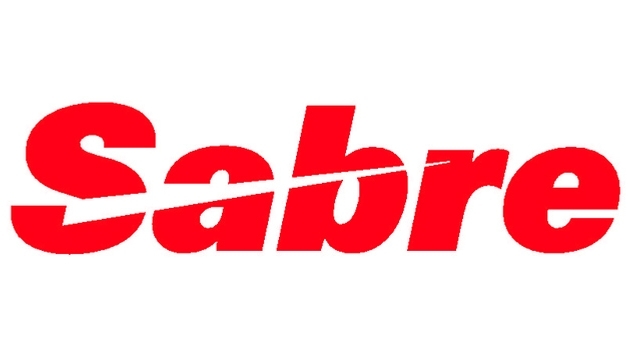 Sabre Corporation today announced financial results for the quarter ended March 31, 2014. Sabre reported Airline and Hospitality Solutions revenues that increased 8.8 percent to $177 million from $162 million in the first quarter of 2013. Travel Network revenues also increased, rising 3.5 percent to $492 million from $475 million for the same period of 2013. Sabre, excluding Travelocity, revenues increased 7.2 percent from the first quarter of 2013. Sabre reported total consolidated revenues of $755 million for the quarter ended March 31, 2014, compared to $759 million for the first quarter of 2013. On an adjusted basis, which excludes the amortization of incentive payments paid under the Expedia strategic marketing agreement (Expedia SMA) related to the restructuring of Travelocity, Sabre reported consolidated adjusted revenues of $757 million for the quarter ended March 31, 2014, compared to $759 million for the first quarter of 2013. Travelocity revenues declined as planned due to the 2013 business model change at Travelocity North America (described below), which is expected to result in a more stable and profitable Travelocity business going forward. Results also were impacted, and revenues reduced, by the sale during the quarter of the Travelocity Partner Network (TPN) business. These changes resulted in Travelocity revenues that totaled $94 million, compared to $143 million in the first quarter of 2013. On an adjusted basis, Travelocity revenues totaled $96 million, a 32.7 percent decline from the $143 million in the year ago period. Consolidated net loss attributable to Sabre Corporation for the first quarter of 2014 totaled $2.8 million, compared to a net loss of $15.8 million in the year ago period. Sabre Airline and Hospitality Solutions and Travel Network Adjusted EBITDA increased 30.8 percent and 2.2 percent, respectively, while Travelocity Adjusted EBITDA declined as expected due to the timing of the transition to the new business model in the North American Travelocity business. Total Company Adjusted EBITDA for the three months ended March 31, 2014 was $184 million, a 4.6 percent decline from $193 million in the prior year period. Excluding Travelocity, first quarter 2014 total Adjusted EBITDA increased 3.7 percent to $209 million from $201 million in the year ago quarter. For the first quarter of 2014, Sabre reported a loss per share from continuing operations of $0.06 per share. On an adjusted basis (Adjusted Net Income from continuing operations per share), Sabre reported first quarter 2014 diluted earnings of $0.18 per share. Cash Flow from Operations was $72 million for the first quarter of 2014, compared to $92 million in the first quarter of 2013. Adjusted Capital Expenditures, which includes capitalized implementation costs, totaled $59 million for the first quarter of 2014, compared to $75 million in the year ago period. 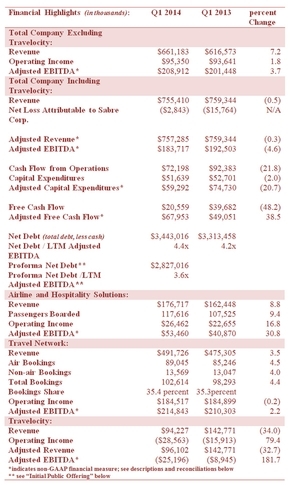 Adjusted Free Cash flow, which adjusts for the decline in working capital and restructuring costs related to the change in the Travelocity business model and dispositions as well as litigation and other costs (see reconciliation below), totaled $68 million in the first quarter of 2014, a 38.5 percent increase from $49 million of Adjusted Free Cash Flow in the first quarter of 2013. Sabre Airline and Hospitality Solutions leverage SaaS and hosted technologies to enable airlines and hoteliers to increase revenues, reduce costs, and provide better travel experiences for their customers. The business segment primarily drives revenues through flat-fees tied to usage events, such as passengers boarded and hotel rooms booked. Strong growth across its customer base and the anniversary of customer implementations completed during the first quarter of 2013 led to an 8.8 percent increase in revenues in the first quarter of 2014. This revenue growth was driven in part by an increase in passengers boarded through the SabreSonic® airline reservation system. Total passengers boarded were 118 million, a 9.4 percent increase from 108 million in the first quarter of 2013. Revenues for the quarter also were bolstered by continued growth in Airline Solutions Commercial and Operations Solutions revenue and strong growth in Hospitality Solutions’ SynXis Central Reservations System transactions and Internet Marketing Services. Strong revenue growth and operating leverage across its SaaS and hosted solutions resulted in a 30.8 percent increase in Airline and Hospitality Solutions Adjusted EBITDA to $53 million for the first quarter of 2014 versus $41 million for the prior year period. · Vimana Franchise Systems, franchisor of the Centerstone Hotel and Key West Inn brands, announced the selection of Sabre Hospitality Solutions SynXis Central Reservations System, continuing the strong momentum in the Hospitality sector. Sabre Travel Network is one of the world’s largest travel marketplaces, transacting more than $100 billion of 2013 travel services with leading solutions for travel agents and travel suppliers. The business primarily recognizes revenue on a transaction-fee basis for travel booked through the Sabre Travel Network. For the first quarter, Travel Network revenue increased $16 million, or 3.5 percent, to $492 million, primarily as a result of 4.4 percent increase in direct billable bookings to 103 million in the quarter, driven by strong mid-teens growth in Europe, the Middle East and Africa (EMEA) bookings and the favorable timing of the Easter holiday as compared to prior period last year. Despite challenging weather, North American bookings grew low-single digits. South and Central American bookings increased mid-single digits, despite a material slowdown in Venezuela due to that country’s current political and economic turmoil. Asia Pacific (APAC) bookings under the company’s Abacus joint venture, which are processed through the Sabre Travel Network, increased high-single digits. Solid bookings and revenue growth resulted in Travel Network first quarter Adjusted EBITDA of $215 million, an increase of 2.2 percent from $210 million for the first quarter of 2013. Sabre Red is the premier agency desktop in the industry. In the first quarter, Sabre launched a mobile version to wide acclaim. The Sabre Red App Centre, which allows Sabre, customers, and third party developers to expand Sabre Red functionality with value-added apps, continued to add new additions to the app store and increased agency downloads. New apps from partners like Trip Advisor (Seat Guru) and Evature Technologies (Red Eva Free text travel search) bring unique capabilities into a Sabre agents work flow. TripCase, Sabre’s leading consumer mobile itinerary management app, ramped to a pace that is expected to result in the app being used to manage well over 20 million trips this calendar year. The number of trips managed is the most important metric for success in this category of mobile travel apps. TripCase is expected to manage more trips than any other product in this space. Through Sabre, airlines are able to market and sell their products the way they choose, generating new revenues and new choices for travelers. Sabre is helping airlines sell seats, bags, in-flight entertainment, and lounge access, among other types of ancillaries. In addition, Sabre helps airlines sell their branded fares, which supports an airline’s ability to upsell during the shopping and booking process. 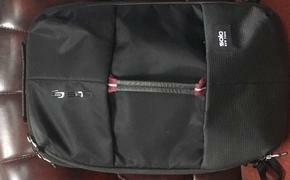 Thus far in 2014, Sabre Travel Network has added 7 airlines to its list of customers using Sabre’s airline merchandising capabilities, bringing the total to over 20 airlines. Bolstering its efforts to increase share in EMEA, Travel Network recently opened its first office in Turkey to provide Turkish travel agencies with its leading Sabre Red agency solutions and connectivity to Sabre’s industry-leading Travel Network content. Turkey is the eleventh new market Sabre Travel Network has entered in EMEA in the past 18 months. Sabre’s agency product is significantly differentiated from competitor products and management expects to continue to win new business with a product-led approach. The Travelocity business segment includes travelocity.com, the #1 customer satisfaction leader in JD Powers most recent survey, and lastminute.com, one of Europe’s strongest travel brands. In August 2013, Sabre entered into a strategic marketing agreement with Expedia that transformed the Travelocity North America business. Under the agreement, the U.S. and Canadian Travelocity websites are being powered by the leading Expedia technology platform, content and customer service. Sabre maintains responsibility for marketing its world-class Travelocity brand. Under the terms of the agreement, Expedia pays Sabre a performance-based marketing fee that varies based on the amount of travel booked through Travelocity-branded websites powered by Expedia, which essentially eliminates Travelocity North America costs associated with technology platform, content acquisition and customer service. The expected net result, once fully implemented, will be lower revenues at Travelocity, but significantly increased profitability. With the new agreement in place and the migration moving ahead as planned, first quarter 2014 Travelocity Adjusted Revenue declined 32.7 percent to $96 million compared to $143 million in the first quarter of 2013. Costs declined through the quarter, but the timing of the transition led to a decline in segment Adjusted EBITDA to a loss of $25 million, compared to a loss of $9 million in the year ago period. Although it is early in the implementation, the transition to the Expedia platform is meeting expectations and driving a meaningful improvement compared to the legacy platform. With the anticipated significant reduction in costs, the company expects stronger financial performance and profitability going forward. On April 17, 2014, Sabre successfully completed an initial public offering (IPO) of 39,200,000 primary shares of common stock. In addition, the underwriters exercised their option to purchase 5,880,000 additional shares, which closed on April 25, 2014. Sabre shares trade on the NASDAQ Stock Market under the symbol SABR. The net proceeds from the offering were used to reduce outstanding debt, including a $320 million reduction in 2019 8.5 percent bonds, and a $296 million reduction in Term Loan C borrowings. Proforma for the debt reduction from the IPO proceeds, March 31, 2014 total net debt was $2.8 billion, and the company’s net debt to LTM Adjusted EBITDA ratio was to 3.6x. In conjunction with the IPO, Sabre announced the adoption of a dividend policy with an initial targeted quarterly payout of $0.09 per share, or $0.36 per share on an annualized basis. The company expects to pay its first dividend in the third quarter of 2014 in respect of the second quarter of 2014. Sabre recently launched three software and data analytics solutions – Customer Experience Manager, Guest Connect Upsell and TripCase Corporate – to help customers design and offer a more personalized shopping and travel experience for travelers. Customer Experience Manager is a data-rich software solution to help airlines leverage traveler insights to deliver a highly personalized experience. With Customer Experience Manager, airlines can automate many manual customer service functions and stimulate revenue – all while significantly enhancing the customer experience. Guest Connect Upsell is a new hotel booking capability that allows guests to upgrade to a higher room class instantly after their booking is confirmed via targeted offers based on the guest’s unique preferences. Guest Connect Upsell enables hoteliers to generate incremental revenue by precisely targeting enhanced services and options that are aligned specifically to a guest’s individual preferences. TripCase Corporate is the business travel version of Sabre’s popular TripCase consumer mobile app, which was used to manage more than 11 million trips in 2013, a number which is expected to increase to more than 20 million trips in 2014. With TripCase Corporate, travelers can make travel bookings and reservations from their smartphone and identify which trips are for business reasons. This enables our customers to better track travel spend, safety and security. General Electric and Hogg Robinson Group are among the first users of TripCase Corporate. The following forward-looking statements, as well as those made above, reflect expectations as of May 15, 2014. Sabre assumes no obligation to update these statements. Results may be materially different and are affected by many factors detailed in this release and in Sabre’s IPO prospectus and quarterly SEC filings.